$1.58 ea. 1.10 ea. 1.08 ea. 1.06 ea 1.02 ea. 1.00 ea. 9” Balsa Wing. Imprint Area: approx. 1¾” x 3¾” each side. Wing MUST have border imprinted as shown, NO Imprint is allowed in middle 3/4” of wing. For standard 250-10,000 pcs. larger qtys contact factory for schedule. A sleek “air superiority” flyer with printed tail surfaces and pilot canopy. Easy to loop and soar. Individually packaged in sealed poly bag. ONE TIME Printing Plate charge (per color): $82. Weight: 21 lbs. Dim wt. : 30 lbs. Cu. Ft: 2.70. 26-1, 250 pieces. Carton Size: 18.75″ x 12.5625″ x 9.875″, wt. 6 lb. 26-1, 500 pieces. Carton Size: 18.5″ x 13.625″ x 15.75″, wt. 12 lb. 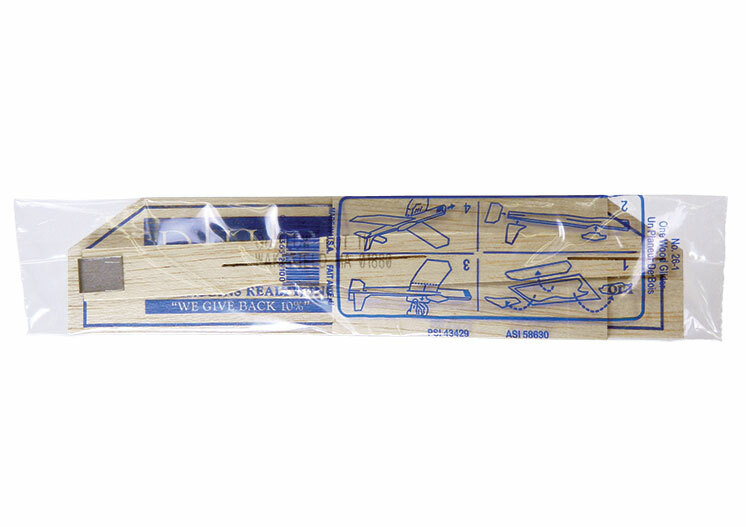 All balsa gliders are individually packaged in a clear heat sealed poly bag. Poly bagged gliders are then bulk packed. Quotation upon request for less than standard case pack. Split shipment charge is $5.00 per carton. F.O.B. POINT: Factory dock in Wakefield Massachusetts, U.S.A. 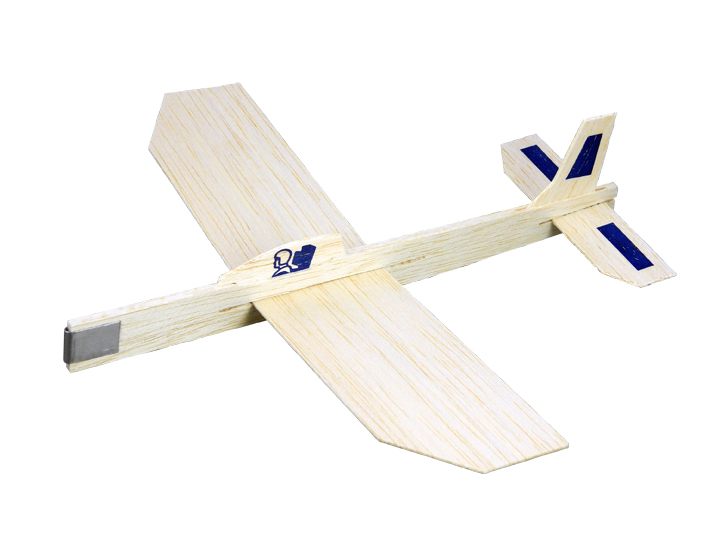 Recommended age for balsa glider is 8 and up. All orders subject to 5% overrun or underrun. 250 pc. 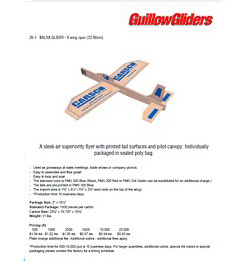 minimum order for all balsa gliders. It is Guillow’s policy to send one free proof on all orders. Proofs are sent via email or fax at no charge within approx. 2 days from receipt of order. Proofs can be emailed if provided with an email address. Proofs will be sent as a pdf file type unless another file type is preferred. Proofs must be approved and either emailed or faxed back to us before plates can be made. Delays in returning proofs will necessitate a new ship date if needed. Tail surfaces and pilot figure on No. 26-1, 30-1, 40-1 and 50-1 are preprinted and remain in standard colors. For any color change see the Other Charges information. Per color (one time). Plates will be disposed of approx. 2 years after last order. Any reorder after that will incur a new plate charge. No copy allowed in center of wing area. All glider wings will have a printed thin border line around the outside perimeter as illustrated in the photos of products. This line is necessary for registration purposes. 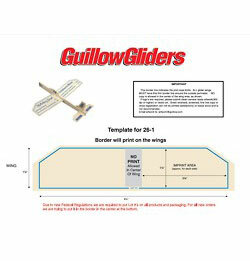 Templates for all our gliders are available on our downloads page. No bleed off wing is allowed. 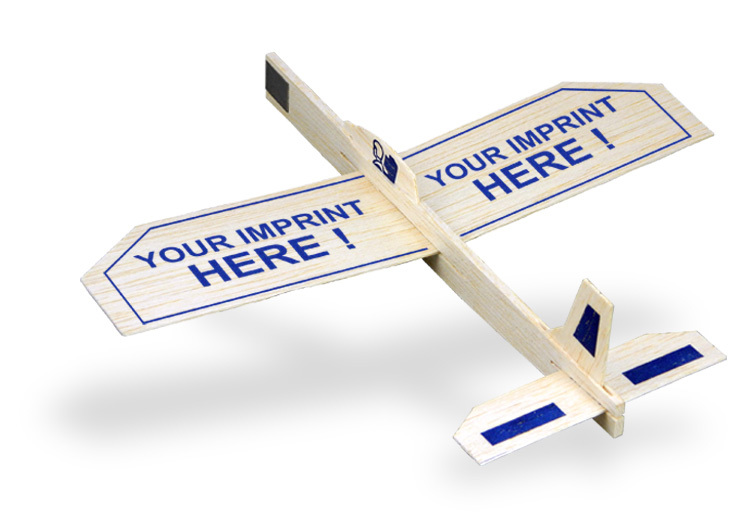 Our Balsa Gliders are printed using letter press method. We print in spot colors only. 4 color process is not available. Multi colors can shift slightly when printed. Tight registration is not recommended. Fonts less than 8 pt. will be hard to read. Bolder fonts can fill in when printed. Reverse or knock out fonts should be over 8 pt. and should be a thicker typeface. Lines that are less than .007″ will not print well. Reverse lines should be .01″ or thicker to get the best print. One color actual production sample available – $138.00 (G). Price includes plate. Up to 10 working days for production. PMS color match charges apply. Additional colors will require additional charges, call factory for pricing and production time. 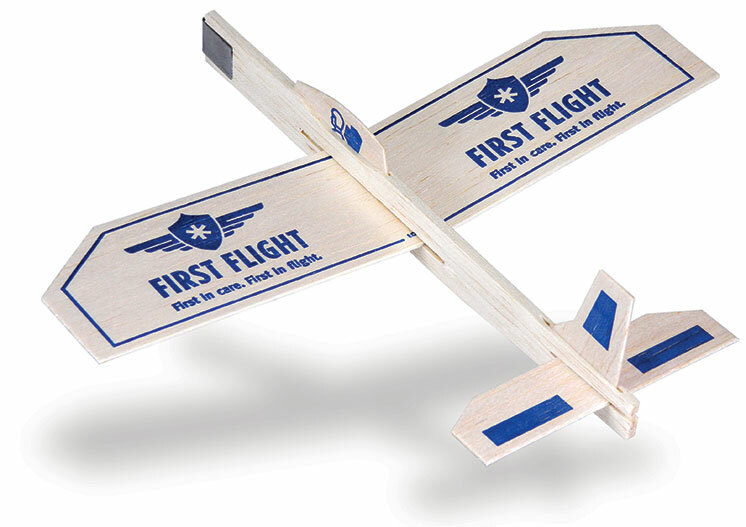 Production times for quantities up to 10,000 are quoted next to each glider. From 10,001 to 25,000 – Approx 20 working days from receipt of order & artwork. Larger quantities, additional colors or special packing please request production schedule. No imprint orders – 5 days. All prices in U.S. Dollars. Subject to change without notice. When preparing and submitting electronic artwork on a USB thumb drive, CD ROM or via e-mail, please observe the following guidelines so that we are able to process your order as efficiently as possible. Our graphics department is set up on a MS Windows network. If you are creating your artwork on a Mac platform, please read the Macintosh instructions listed below to increase the likelihood of a successful output. When sending digital artwork we recommend that you send/fax a hard copy printout along with your order, so that we can verify the integrity of the digital file. Programs used by Guillow’ s graphics department . . .
Adobe Illustrator CC –Our standard graphics program. We can accept .ai files & editable .pdf files (must be able to edit file in Illustrator). Please convert any fonts to outlines! CorelDraw X6 – Your artwork can be saved in .cdr format or as an .eps file, Corel is very good at importing .eps files from other programs. Please convert all fonts to curves! Other programs – Most graphics programs can export an .eps file, if you use anything other than CorelDraw or Illustrator, please do this! Please convert typefaces to curves, paths, or outlines before sending artwork. If your artwork has been created using other programs: (Microsoft Word, Microsoft Works, Power Point, etc. ), please contact us to discuss an alternative solution. We cannot accept Quark Express files. If the electronic file is unusable for any reason, you will be asked to supply original art or to remedy any problems and resubmit the file, this may delay your orders ship date. Raster / Scanned artwork – Raster images are acceptable to us if they meet minimum standard requirements; Must be clean black and white image (no color or grey tones), at least 300 dpi for balsa at the size they are to be imprinted on our product. .JPG and .TIF images are acceptable. Mac Instructions – If saving your digital artwork from a Mac computer, please take special care in naming your files, Windows cannot accept any “special characters” and needs a valid extension after the file name (An example of a good file name would be: comanyname-po12345.eps) Also, Mac fonts are not compatible with Windows so please take special care to make sure they are converted to curves or outlines. EPS files generally work the best for us to import when you’re saving from a Mac graphics program. Acceptable Media . . . Via email to artwork@guillow.com (The preferred size of a file is no larger than 7MB) Please include in the e-mail message, your name, company name, Purchase order number and item you are imprinting. Note: If you have multiple images or large files, you may want to compress them using compression software (we use WINZIP).